Cheap oil is forcing Saudi Arabia and Russia to cut the unthinkable. 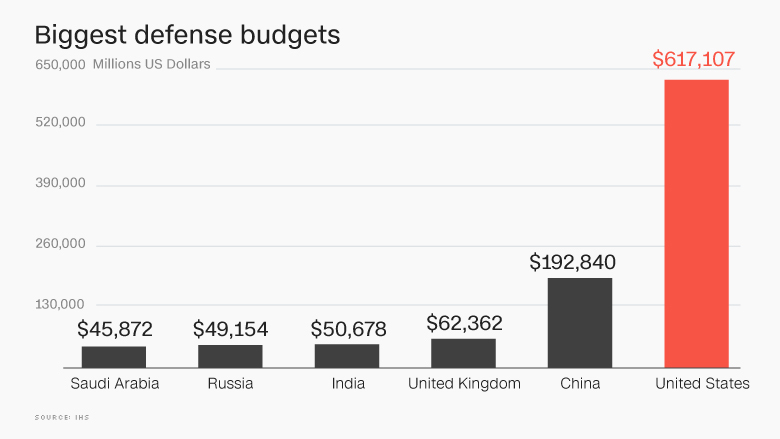 Their defense budgets. The collapse in crude prices has forced Russia and Saudi Arabia to cut their spending. Both these oil-producing countries are among the world's biggest military spenders, and defense cuts have long been off limits. But military spending for both has dropped this year, according to the latest IHS data. Russia's defense budget shrank by 5.6% to $49.2 billion in 2016 from $51.5 billion last year. Saudi Arabia's defense budget fell 3.6% to $45.9 billion in 2016 from $47.6 billion in 2015. 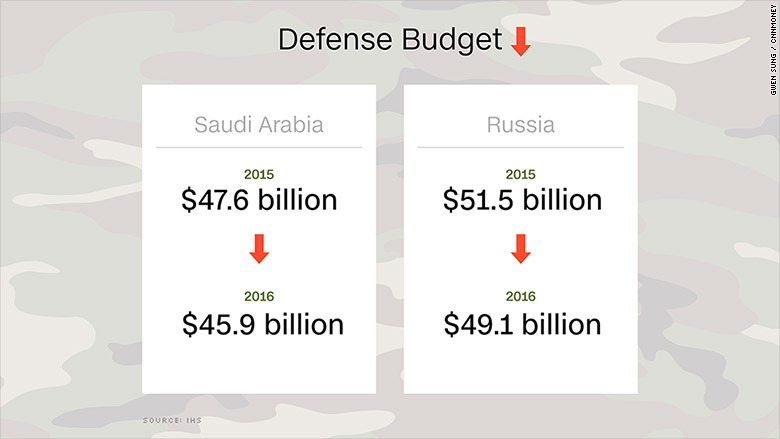 "What's happening to Russian and Saudi Arabian defense spending is very much down to oil," said Craig Caffrey, a senior analyst at IHS. "Defense and security concerns are arguably far more important now than they were when their defense budgets were growing at 15-20% a year, there's just no more fiscal space for further increases," he added. 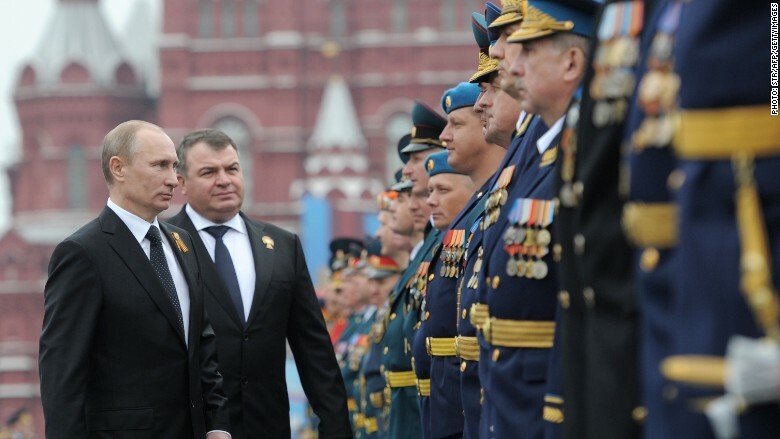 Russia has been beefing up its military spending in recent years, investing heavily in upgrades to its military capabilities. "Russian defense spending was starting to look unaffordable even before 2015's economic and fiscal downturn," said Craig Caffrey, a senior analyst at IHS. Russia has been hit hard by the sliding price of oil, since about half of its government's revenue comes from oil and gas exports. The government expects to run 3% budget deficit this year, the maximum Russian President Vladimir Putin said he will allow. But experts have warned that might be too optimistic. Russia's budget is based on the assumption it can sell its oil for $50 per barrel, way above the current price of about $38. Saudi Arabia also faces a huge budget hole because of the collapse in crude prices. Oil accounts for 75% of its revenue. The kingdom even hiked prices of gasoline to prop up the budget. The government ran a deficit of nearly $100 billion in 2015, and ordered a 14% reduction in spending this year. Defense spending was cut, according to IHS, despite the worsening security situation in the Middle East region, especially in neighboring Yemen, Syria and Iraq. Defense spending in the Middle East grew faster than in any other region globally between 2012 and 2014. But then oil prices crashed. "We saw the first marginal cuts in 2015 but, those cuts are now expected to deepen in 2016," Caffrey said. India -- a big oil importer -- is on the flip side of the crude crunch. Morgan Stanley (MS) estimates India saved as much as $47 billion in 2015 thanks to the slump in prices. The government is investing the money elsewhere, spending on infrastructure and also cutting subsidies. It also boosted its defense budget by 13.1%, according to IHS (IHS). The boost meant India has taken over both Saudi Arabia and Russia to become the world's fourth largest military spender. India overtook China as the world's biggest importer of weapons in 2012.